… and a little bit further away too because history is never far away in Kent. It’s not for nothing that Kent is known as the Garden of England. And nestling in Kent’s hills and valleys are many glorious open gardens. Canterbury is no exception! For there are several gardens in Canterbury alone. There are also lots of beautiful gardens near Canterbury., although some are nearer than others! But it seems wrong not to include some of Kent’s historic gardens here, all of which are in easy reach of Yorke Lodge Bed and Breakfast. As with all the Canterbury gardens, the Franciscan Gardens are an oasis of tranquility. They are also one of Canterbury’s best kept secrets! They initially belonged to the first Franciscan friary to be built in England. All that remains now is Greyfriars Chapel and the gardens. They can be accessed through a courtyard off Stour Street. These Canterbury Gardens take their name from Edward Lord Wootton’s widow. They are on the site of St Augustine’s Abbey. After the reformation Henry VIII kept part of the abbey for himself. Later, in the 17th Century, Lord and Lady Wootton lived here. Hence the garden at the front became Lady Wootton’s Green. In 1896 the area was transformed into public gardens. These Canterbury gardens link Canterbury Cathedral, St Augstine’s Abbey and St Martin’s Church. Together they form a UNESCO World Heritage Site. If you Google Miller’s Field you’ll most likely find it’s a car park! Which it is! However, it’s located on the Causeway next to the River Stour. And it is surrounded by water! There are grassy areas on which to sit and enjoy the riverside views. So it’s perfect for picnics and with easy parking! These Canterbury Gardens are alongside the Butterfly Garden6. This is a very small open garden. It is a peaceful spot, right in the centre of the city. Paved with natural stone, it’s specially planted to attract bees and butterflies. Further down the Causeway is Abbot’s Mill Gardens. Home, funnily enough, to Abbot’s Mill! No longer a working mill, a project has been launched to restore its waterwheel. But instead of grinding wheat, the plan is to generate electricity. The gardens themselves, though, are a haven of relaxation. You can enjoy a drink too at the Miller’s Arms! A continuation of Abbot’s Mill Gardens, a Dominican priory once stood here. Thus these Canterbury Gardens were the priory’s apple orchard. They are a lovely open garden through which to approach the city centre. Cross the River Stour at Whitehall Road into Westgate Gardens. The Westgate Gardens River Walk follows the Stour to the historic West Gate. These Canterbury Gardens once belonged to nearby Tower House, an early Victorian residence. The last owner was Catherine Williamson who became Canterbury’s first female mayor in 1938. After her death the house and gardens were given to the city of Canterbury. Tannery Field. As you might expect a tannery once stood here! And there is a tribute to its historic roots too. A sculpture of a bull has recently been installed in these lush riverside Canterbury gardens. Bingley Island. Bingley literally means “encircled within a river”. So it’s a double island! Once used for grazing cattle Bingley Island is now a nature reserve. It is therefore a haven for wildlife with lots to explore. Toddler’s Cove. A swimming pool was built here in 1876. A huge success it remained popular well into the 20th Century. In the 1960s the seaside was recreated on this spot. With a paddling pool, sand pits and even donkey rides. Today it is a children’s play area for the 21st Century. 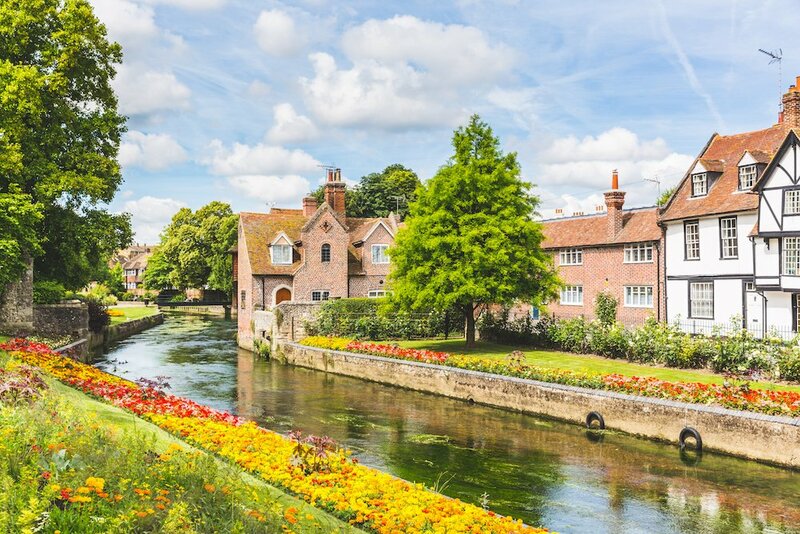 These Canterbury gardens are within the city walls. There is a burial mound, probably from the first century. A motte and bailey castle was later built here by William the Conqueror. The formal gardens were created in the 1790s. Two hundred years later, the City Council undertook a million pound restoration of these Canterbury gardens. This included a new bandstand and children’s play area. There is also a shaded walk flanked by lime trees. There are spectacular views of the city and surrounding countryside from the mound. The layout of Belmont Gardens dates from the 1790s. However, time has not stood still here! Generations of gardeners have overseen innovative new designs. Allowing the gardens to keep pace with the centuries. Nevertheless, the basic layout of the gardens remains. There is a walled garden, kitchen garden and formal lawns. Also a pinetum as well as wooded areas. There is a tea room. Seasonal plants and produce from the kitchen garden are available for sale. The gardens are open all year round 10am – 6pm (or dusk if earlier). The house is now closed for the winter. The Salutation is a Grade I listed house. The gorgeous gardens are a designated historic park and garden. They were designed by Lutyens and Jekyll. And are perhaps the “finest example” of all their historic garden designs in the UK. This lovely open garden includes the White Garden, Bowling Lawn, the Long Border and Tropical Border. There is also a Wollemi Pine. This is a rare tree of ancient origins with roots going back 90 million years. Not literally, of course, for this Wollemi Pine. But just to show that its family tree is long and distinguished. The Secret Gardens are open all year round from 10am. And there is a gift shop and tearoom. But shh, don’t tell anyone! Godinton has been a working estate for 600 years. Majestic parkland, including oaks and chestnuts, surrounds the house and gardens. There are 12 acres of gardens in total. These have been fashionably remodelled over the last 400 years. But what we see today largely dates back to Reginald Blomfield’s 1898 design. There are terraced lawns, yew hedges and herbaceous borders. Also a kitchen garden, walled garden, rose garden and Italian garden. The gardens are open daily: 1pm – 6pm to 1st November. The house is now closed for the winter. There is no tearoom or shop, but picnics are welcomed. Walmer Castle was built by Henry VIII as a fortress. But it evolved into a coastal home for the Lord Warden of the Cinque Ports. Distinguished occupants include the Duke of Wellington, Winston Churchill and the Queen Mother. As a home the moat was grassed over in the 19th Century. The gardens would also have been laid out during this time. These include a commemorative lawn, woodland walk and kitchen garden. There is also the Queen Mother’s Garden. This was created to celebrate her 95th birthday. Open in October from 10am – 5pm. From 1st November to 23rd December – Saturday and Sunday only 10am – 6pm. Run by English Heritage entry is free to members. The gardens were originally laid out in the 15th Century. This is when the first Manor House was built here. The Powell-Cotton family took ownership of the park in 1777. They demolished the original house and replaced it with a Regency building. It is therefore no surprise that the gardens have a strong Regency influence. Further remodelling over the 19th and early 20th Centuries added Victorian and Edwardian keynotes. The Powell-Cotton family were inspired by nature. Nowhere is this more evident than in the gardens and parkland, naturally! Leeds Castle has over 500 acres of gardens and parkland. The formal gardens include the Culpepper Garden. Once the kitchen garden, this is now a large cottage garden. The Woodland Garden, where the colours change with the seasons. And the Lady Baillie Mediterranean Garden, a relaxing space inspired by the Riviera. From here there are fabulous views across the “Great Water”. And there’s a great deal of water at Leeds! The moat and extensive lakes are home to a thriving population of wildfowl. Including black swans. These gardens were created by Vita Sackville-West and Harold Nicholson in the 1930s. They remain an inspiration to all gardeners. The innovative design of the gardens provides ever-changing seasonal colour. Particularly the White Garden and “hot coloured” cottage garden. The latter is also known as the sunset garden where Vita liked to sit in the evenings.The Sissinghurst estate comprises nearly 500 acres. These include woodlands and lakes where wildlife abounds. There are wonderful dog walks through the Wealden countryside. Also a new hide from which to watch birds. The property is owned by the National Trust. The gardens close on 31st October, but the estate remains open from dawn to dusk. The shop and restaurant are also open from 10am-5.30pm. Until 31st October tickets include entry to the Tower. The property is owned by the National Trust. The gardens are open from 10am – 5pm until October 29th, thereafter from 10am – 3.30pm. The same opening times apply to the cafe and shop. There is also partial access to the house. The estate is open from dawn to dusk all year round. And the ancient woodland will be wreathed in autumn splendour. So a bit further away! But who can resist the childhood home of Anne Boleyn? And the gardens are gorgeous. Of course Anne Boleyn wouldn’t have seen the Edwardian gardens designed in the early 1900s. This is when William Waldorf Astor began his painstaking restoration of the castle’s long-neglected gardens. Including the four acre Italian garden created to display his collection of Italian statues. There are many water features throughout the gardens. And much in the Tudor style that Anne Boleyn would recognise. Not least the autumnal glory of the parkland surrounding Hever Castle. On line prices are also available. Chartwell is close to Hever Castle. And an important historical figure also lived here. It was the home of Sir Winston Churchill from 1924 until the end of his life. Churchill adored Chartwell and spent a great deal of time in the gardens. He created the lakes where you can picnic. His kitchen garden still thrives, providing the cafe with produce. The estate includes a large area of woodland with nature trails. But for a gentle stroll, take some time to simply wander round these lovely hillside gardens. This property is owned by the National Trust. The house opens daily from 11am-5pm, but closes on 30th October. The gardens, however, remain open between 10am and 4pm as do the cafe and the shop. Emmetts Garden is a woodland garden. It is close to Chartwell and also owned by the National Trust. As such there is a circular walk linking the properties. It’s 5 miles in total and takes about 3 hours. And it does make sense to combine a visit to these two Kentish gardens. Even if you don’t take the circular walk. Emmetts Garden houses a thriving collection of plants and trees. With some rare and exotic species. Amongst the trees is the highest treetop in Kent. And all this despite the devastation caused by the terrible storm in 1987. But also because of the tremendous care and extensive replanting that followed. Owned by the National Trust the Gardens are open between 10am and 5pm until 29th October. Thereafter they will close at 4pm or dusk if earlier. The shop and cafe are open as per the Gardens. All timings are approximate and obviously depend on traffic, roadworks etc. Other information correct at time of writing, but please check before visiting.